We were honored to be a part of the dessert display for the wedding of the former editor, Ali Basye of Seattle Bride and her now new husband Todd. All the French pastries were created by the Tallant House. The spread was truly amazing; from home made marshmallow Smores, tarts, chocolate domes and more. All… simply delicious! and Olivia Silver/White with individual pies set into each wrapper. 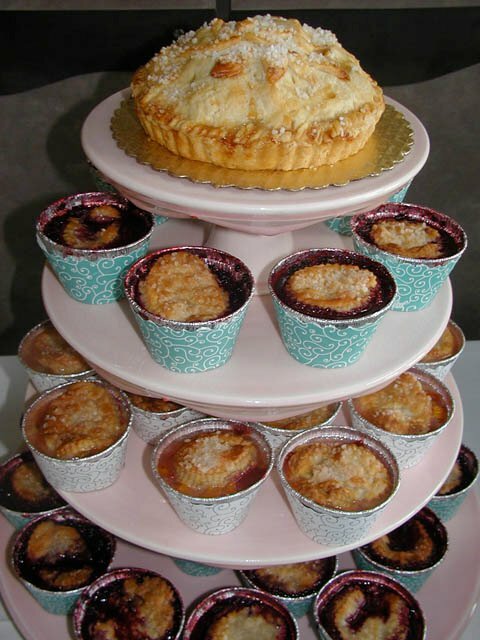 Each Pie a’ la Bella was placed sweetly on a beautiful Clara French cupcake stand. White cupcake stands with other pastries were provided by Totally Tabletops. The whole display and French-inspired wedding set up was absolutely gorgeous! The wedding will be featured in an upcoming article. We will keep you posted.